In a little more than a month, dino-sequel Jurassic World: Fallen Kingdom will roar into cinemas, picking up four years after the events of the last film. 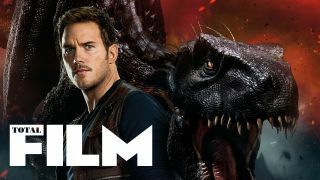 Chris Pratt’s Owen Grady is called back into action on Isla Nublar when a volcano erupts threatening all life on the island. Pratt’s currently busy fighting Thanos in Avengers: Infinity War, but one huge summer blockbuster clearly isn’t enough for him, as he can now be seen in Jurassic mode on the new Total Film magazine cover, standing alongside the series’ terrifying new creation: the Indoraptor. Every Jurassic movie needs a new monster, and Fallen Kingdom’s is the Indoraptor, most recently spotted causing havoc in the final trailer. A genetic hybrid, the Indo is something like an oversized Velociraptor, engineered to be the ultimate killing machine – what could possibly go wrong? The new issue of Total Film magazine hits newsstands on Friday May 4, and as well as all the Jurassic World: Fallen Kingdom goodness inside, it also comes with a 36-page Jurassic Park celebration mag, a Jurassic World art card, and a How It Works: Dinosaurs ebook. Featuring interviews with Pratt, Bryce Dallas Howard, Jeff Goldblum, new director J.A. Bayona and writer/producer Colin Trevorrow, it’s essential reading for franchise fans. Keep your eyes peeled for more details on Total Film’s Jurassic World: Fallen Kingdom special over the next few days. The film hits UK cinemas on June 6, before opening in the US on June 22. And, to celebrate, the Jurassic World cover, we're currently running a subscription offer, where you'll get Ian Malcolm and T-Rex Funko Pops when you sign up for a print or bundle subscription!